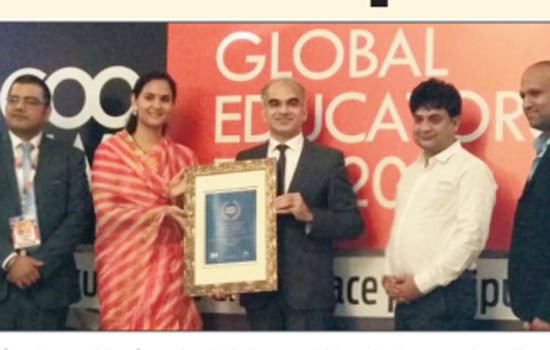 Udaipur: Carving a niche for itself in giving quality education in the preschool category in India for over a decade, Little Millennium, one of the leading and finest chain of preschools today added a feather in their cap by bagging the prestigious Best Pre - School Chain of the Year - Jury's Choice award at the ScooNews Global Educators Fest 2018held today in Udaipur. The award was received by Mr Raman Bajaj, Chief Executive Officer, LittleMillennium Education Pvt.Ltd. TheScooNews Global Educators Fest 2018 conference is one of India’s most preferred and potential brainstormingepicenterfor new policy initiatives.ScooNews Global Educators Fest 2018 conference was attended by over 500 education leaders who created a strong buzz for new policy initiatives and ideas in the field of education. Speaking on the occasion, Mr Bajaj said, “While we are at the cusp of change with multiple challenges at every step, we can never negate the fact that it is entirely our education, grooming and shaping up from tender age that makes us face these challenges with ease, courage and fortitude. The crucial formative years are the best and most important years in the life of our children. “I am very grateful and delighted to receive this award. The real credit goes to the thousands of teachers and hundreds of principals, who work in our preschools, passionately and tirelessly. It is because of our teachers that our brand has become an epitome of hard work, good corporate ethics ans solid social values.” Mr Bajaj added. Many eminent educators from India and abroad had arrived at Udaipur and attended the second edition of the ScooNews Global Educators Fest. This conference, was organized by ScooNews – a Jaipur based education media house, is quickly becoming the preferred destination for eminent educators from across the globe for brainstorming advances in education. influential personalities like Varun Gandhi, MP, Dr. Swati Popat Vats, President Podar Education Network, Sean Slade, ASCD USA, Anand Kumar of Super 30, Prof. B.P. Sharma, Pacific University, LataVaidyanathan, Founder Principal, Modern School, Barakhamba, and many more shared the views.ScooNews introduced the Jewels of India Awards from this edition of the Fest. This Award celebrates a handful of educators from amongst thousands who become a beacon of inspiration for others. What sets these awards apart is that no nominations are invited, rather educators are identified by in-depth, year-round research focused on identifying educators who are making a far reaching impact in the field of education and have the potential to inspire fellow educators to change the game. The Festwas encouraged by Lakshyaraj Singh Mewar and is being held in the fairy-tale like City Palace of Udaipur. The Fest promises to be a sensory treat for all visitors as they will spend 2 days in the splendid City Palace overlooking the iconic lake Pichola. The glittering awards ceremonies for Teacher Warriors and Jewels of India promise to be truly memorable as they will be held at the world renowned Jagmandir Palace right in the middle of Lake Pichola. The Fest positioned as ‘India’s largest education brainstorm’ and is designed to facilitate sharing of ideas, best practices and encourages networking to diffuse the latest developments amongst all attendees. Ensconced away from worldly distractions, this year’s edition, like last year, promises to be a highly intellectual affair equipping the participants with workable and practical ideas. Welcoming the delegates at the Fest, Mr. Ravi Santlani, CEO, ScooNews said, “ScooNews Global Educators Fest is a platform that is rapidly cementing its place as a productive brainstorm session for educators from across the globe, and our most eminent speakers and delegates vindicate our offering. We have chosen Udaipur as the venue for this year’s fest as it is the most beautiful place in India to be in during the monsoons and great beauty can truly inspire progressive thinking. I wish that all the educators benefit from this year’s Fest and go back with many productive and practical ideas and best practices.”.